Sara first learned she had brain cancer when she was training for her first half-marathon at age 25 and collapsed at work. SARA Chivers was diagnosed with terminal brain cancer, just before discovering her 18-month-old son also had a brain tumour. Sadly, she died peacefully in her sleep at 7am on Sunday, January 28. She was surrounded by family. 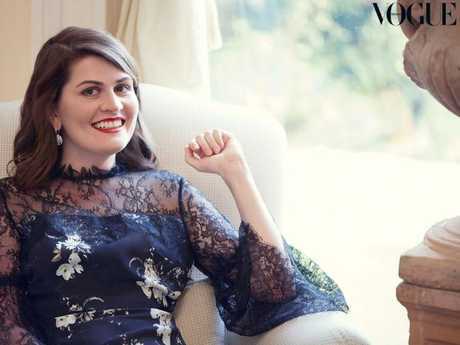 Sara shared her heartbreaking story in Vogue's February issue - a feature and shoot that was a bucket-list dream for the Melbourne mum of two. She posted about it on Instagram, a week before she passed away. Sara's fight is one we should never forget, and we can show our support by giving generously to the Cure Brain Cancer Foundation. Some people collect coloured glass or vintage cufflinks or old kitchen tins. I'm a keeper of mementos. Cards - birthday, Christmas, engagement, wedding, both boys' arrivals - hospital name tags, the poem my husband Leigh wrote for my 21st birthday, first baby clothes. It's the sentiments they hold. I treasure them. In the last few months, I've also collected memories. I am living with terminal brain cancer and, thanks to three inoperable, incurable, creeping tumours, the question isn't whether I will die from this disease, it's when. I am facing my mortality, so remembering incredible times and writing goodbye letters to Leigh and my sons Hugh and Alfie has become a race against time. It doesn't deserve top billing, but maybe it's best to get the shadowy evil out of the way early. Brain cancer and I first met when I was training for my first half-marathon at age 25 and collapsed at work. Three surgeries and seven weeks of radiation therapy later, I had scar tissue and a large cavity in my brain, but the beast was effectively tamed. I got on with life, the spectre of cancer becoming less terrifying as years passed. Then on a muggy day in March last year, in a room with scuffed walls and bad light, I had a death sentence delivered while Melbourne went by outside. That was surreal. It's surreal to know I have been given such a short life time frame. To know I won't get to see Hugh and Alfie start school, graduate, forge careers, find partners, get married, have their own children. It's surreal to know I won't see old age. And that I will leave Leigh a single dad. I have so much grief for a life I won't be living. Sara photographed by Justin Ridler, styled by Petta Chua for Vogue Australia, February 2018. As my aggressive tumours refused to crumble to chemotherapy, I lost movement down the right side of my body. Tying up my hair, opening a bottle and showering became puzzlingly hard. I concentrated on choosing kitchen splashback tiles to fend off the searing pain that came with life turning into a waiting game with death. But then came the cruellest twist. In September, Alfie was also diagnosed with an aggressive and rare form of brain cancer. Some statistics suggest three children in one million have it. There are no words that do justice to the way in which our hearts have been shattered for our beautiful little boy. Blood tests could not find an inherited genetic mutation, so this may just be the most horrible of coincidences. Lightning can strike twice. Alfie's diagnosis with the paediatric illness that kills more Australian children than any other gave me a new momentum. Within a day, cruelly kind knives were cutting inside his dear little head, which swelled like a cartoon image despite a shunt to drain fluid. There was despair: the best treatment option to kill the tumour and not leave him disabled from lifesaving poisons was in the US, which would take him and Leigh away from me and Hugh for perhaps a year. There was triumph: he was accepted into the US trial, and of course he had to go; he came first. There was new despair: he was too sick to fly. There was renewed hope: he started best-practice chemotherapy in Melbourne and still managed to smile hugely at me after daily four-hourly sessions of slow intravenous dripping. After Alfie was diagnosed I had surgery on the most insistent of my tumours and started radiotherapy again, in a last-roll-of-the-dice scenario. And I kicked the memory project into high gear. Hugh and Alfie need to know about who I really am, and how much I love them and their dad and the world we made. Now able to only type with my left hand, I am fighting to tell my story, not the kind, homogenised one everyone knows, but my own. There's no order or importance to what I want to say. Like I've always been pedantic about the state of my books. That I cried countless times as Mum ripped out the sealed sections of my Dolly magazines when I was 13, which was more about her ruining my beloved magazines. I can't stand price tags that leave behind that sticky film. My perfume of choice is Michael Kors. My consumption of Whittaker's coconut chocolate is next level. Chick lit is my favourite literary genre. I've always had an obsession with numbers and dates (I loathe odd numbers). Winter is my preferred season. I wish I was a better cook. At the heart of the Sara jigsaw, far from the edges, is Leigh. We went to brother and sister schools and there was a lot of fanfare about him, because of his good looks and athletic build. We first kissed after a rowing after-party and I didn't find out until years later that one of our friends said that night we would get married, which we did on a fabulous, riotous day in 2012. I had always considered myself a career woman, then suddenly the desire to have a baby was all-consuming. It took five months of trying before those two thin lines appeared. We wanted to tell our families on Christmas Day and I gave Leigh the responsibility. After we unwrapped presents, one was left under the tree. Leigh said it was for me. I pulled out a Country Road baby onesie and the significance dawned on the family. I burst into tears. After 10 tumultuous months with Hugh, we were both shell-shocked and delighted to find out I was pregnant again. It felt right, making a home and having two perfect children to care for. Now, my marriage and family have given me something special to live for, which sometimes makes it even harder to think about not being part of their future. Ten years on, I am in love with Leigh's courage, care and willingness to pick up the pieces and continue to move our family forward regardless of the obstacles in our way. My love for Leigh knows no bounds, so I would always want him to find happiness, with me or after I'm gone. More than anything, I want to be there to see our family grow together, but I find the thought of another long-term female presence just as comforting for the boys' future and Leigh's happiness. Leigh is too young to live the rest of his life alone. I have faith he will make the right choice for himself and the boys. The doctors really don't know how much time I have left. It's all about options and how long they might be effective for. Right now my greatest fear is not so much how much time, but how much quality time. With my speech now being affected, I'm more fearful of further loss of capabilities than how much time I have left. Underneath the complexity and sadness of our situation, I believe nothing can be wholly good or bad unless we choose or decide it is this way. I am a perfectionist, priding myself on impeccable manners, hard work, style. But I am also honest: I must let go of my previous life and absorb that the odds are no longer in my favour. I hope by telling my story, I can help change this for Alfie and those yet to be diagnosed. 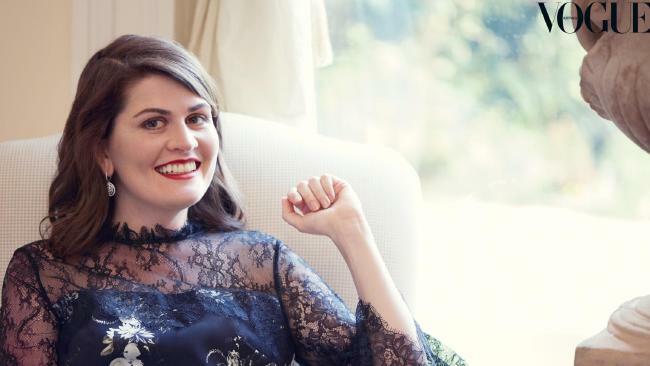 This story originally appeared in the February 2018 issue of Vogue Australia. Please give generously to the Cure Brain Cancer Foundation.